First Line: It was generally agreed by the female residents of Meryton that Mr. and Mrs. Bennet of Longbourn had been fortunate in the disposal in marriage of four of their five daughters. In her Author's Note, P.D. James apologizes to the shade of Jane Austen who, in her final chapter of Mansfield Park stated, "Let other pens dwell on guilt and misery...." Although Austen would have no truck with murder, I had the highest of hopes that this Grandmaster of Mystery would mine one of my all-time favorite books-- Pride and Prejudice-- and strike literary gold. The book begins well with gossip of how everyone has fared since the end of Austen's classic, and James did provide a surprise or two. She also proved that her writing could sound like her predecessor's. However, the gossip went on too long, and I was beginning to wonder if anything was going to happen. 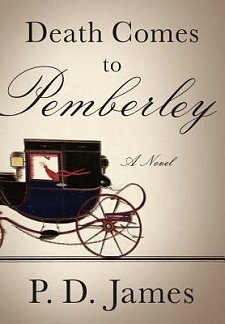 Finally Lydia arrives at Pemberley in a cloud of dust, the coach rocking wildly, the horses foaming at their bits-- and Lydia screaming and babbling. Captain Denny had the coachman stop in the woods! Denny got out of the carriage! Her dearest Wickham followed! There were shots fired! Her most wonderful Wickham is killed! It is the eve of the ball at Pemberley. Colonel Fitzwilliam and the Bingleys are spending the night. Elizabeth and Jane gather the witless Lydia and take her into the house. Colonel Fitzwilliam gives orders, and he and Darcy have the coachman take them back into the woods. They find Denny dead and a bloodstained Wickham over the body. Wickham mumbles what could be a confession, but since he's three sheets to the wind, Darcy isn't certain. What he is certain of is that Wickham will be going on trial for his life. I realize now that I really didn't know what I expected from this book. Whatever it was, I didn't get it. Austen's marvelous characters are curiously lifeless in Death Comes to Pemberley. Darcy, who thought nothing of taking charge in the matter of Lydia's elopement with Wickham, is quite content to be quiet and on the sidelines here. And Elizabeth? She of the sparkling wit and pithy comments? She practically blends into the wallpaper and scarcely says a thing. After finishing the book, I did feel distinctly cheated, and I worked hard to deduce exactly why I did. I went down a list of "I wish___________." I wish Colonel Fitzwilliam hadn't turned into such a snob. I wish Darcy had shown more backbone and taken a more active part in things. I wish Elizabeth and Jane had done more than play nursemaid to Lydia. Why was everyone so blasted passive? Then it dawned on me. James had to be true not only to the period of time in which the book takes place but to the class of people the Darcys are. A Darcy doesn't turn sleuth and question everybody and look everywhere for clues. That's what those other classes are for. And why-- outside of preserving reputations and social standings-- would they want to help someone like Wickham anyway... a man who'd already tried to bring disgrace to their families? In the end, I found that James stayed true to the era, but it was like wearing a heavy, tight pair of handcuffs. Only Jane Austen, a woman of those times, could have succeeded in writing the type of book I'd anticipated-- and she was wise enough not even to try. Death Comes to Pemberley at Amazon. Death Comes to Pemberley at The Book Depository. Death Comes to Pemberley at Your Favorite Indie Bookseller. I've seen this all over the blogs but this has not come to our local library as yet! I've heard others say this isn't that great. I think James' should stick with her own style. I've been hesitating over this book although P.D. James is a goddess in this house. Sadly, I think I'll have to pass. I've dreaded James' age diminishing her writing; perhaps that has something to do with it? Or maybe you're right that she should just stick with what she has always done so well. We're in agreement here, Cathy. I reviewed it as well and with similar misgivings. I thought the book was dullsville. And I too, expected great things when I requested it for Christmas. Mystica-- With an author like P.D. James, I'm sure it will arrive soon! Kathy-- I'm glad she tried to work outside her familiar milieu, but it certainly wasn't successful for me. Margot-- I give her credit, too. I'm not a reader who insists that a favorite writer stick to the same old same old for every book. If you don't try, how do you know you won't create something even better? Barbara-- She can try new things. If I were her, I don't think I'd attempt another 18th century mystery where almost all the characters are from the upper classes. Yvette-- I can see where the changes to his character could be natural and almost expected, but I didn't appreciate it either.